Gran Canaria is a dive destination with the protected reserve El Cabron, volcanic offshore reefs and many wrecks because of its rich history and excellent harbor. Gran Canaria, Tamarán or The Little Continent is one of the busiest and most touristic islands of the Canaries. This circular island is separated in a cooler but wetter northern part and warmer but dryer southern part, separated by its highest point Pozo de las Nieves (1949m). You will find huge cliffs in the west such as Farroque and Anden Verde, green pine forests in the north and most of its excellent beaches and palm trees are found in the south at Maspalomas. Popular strips of bars, restaurants and nightlife are Playa del Inglés, Meloneras, Puerto Rico, Puerto de Mogan and Arguineguin. Other activities often done are sand boarding at the dunes of Maspalomas, surfing at Poza Izquirdo or just relaxing in the sun with a book and some refreshing drinks. You can visit the more than two hundred meter deep volcanic cone Caldera de Bandama or spent some time in one of the museums. Its deep and high current waters are very popular for deep-sea fishing boats as well and it will be easy to book a tour from many of the small fishing villages. Don't forget to take a look at the capital Las Palmas de Gran Canaria offering museums, theaters, bars, excellent shopping, entertainment and even Las Canteras beach right in its center. It is the largest city on the Canary Islands, being the cultural and economical capital, with highlights such as the old quarter of Vegueta and several old Spanish architectural monuments worth looking at. 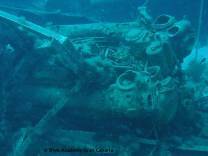 For divers you can visit several great wrecks especially at the harbor of Las palmas de Gran Canaria or pay a visit to the El Cabron or Arinaga Marine Reserve, which is just one of the three protected reserves on the Canary Islands. The north is, because of swells, not regularly dived with exceptions such as dive sites La Catedral and Sardina del Norte. Most dive shops visit El Cabron in the south, because of its easy entrance and excellent fish life, but dive tours that have boats can reach many other rewarding dive sites. You will be diving at places rich of volcanic activity; excellent offshore reefs such as Pasito Blanco and special wreck dives you will never forget.